This rewarding walk from Bundeena Drive to Little Marley Beach leads through heath, past fresh water pools and creeks, and on to scenic beach views in Royal National Park. Forest path is an easy walk in Royal National Park. It's great for kids and just 1 hour south of Sydney. Wander through cabbage tree palms and Gymea lilies on the path beside Bola Creek and the Hacking River. A perfect day trip from Sydney, Uloola walking track is a long but picturesque walk through the waterfalls, wildflowers and sandstone formations of Royal National Park. A challenging walk through heath and waterfalls, the Curra Moors loop track offers scenic sandstone cliff and coastal views, waterfalls and great birdwatching. A challenging yet spectacular walk, Palm Jungle loop track takes in rainforest, cliff tops, beaches and scenic coastal views in Royal National Park, near Otford. Wheelchair-accessible Bungoona path and lookout offers fantastic scenic views of Hacking River, with picnicking and birdwatching. It’s a great family day trip south of Sydney. Enjoy scenic views of the river along Ridge walking track - a short walk from Burrawang Beach to Cattle Duffers picnic area in Georges River National Park. Wedding Cake Rock is a popular and very fragile rock formation located along the challenging Coast track in Sydney's Royal National Park. Experience the beauty of this natural wonder without risking your safety. Celebrate the 2019 Australian Heritage Festival at Royal National Park, southern Sydney, in May. 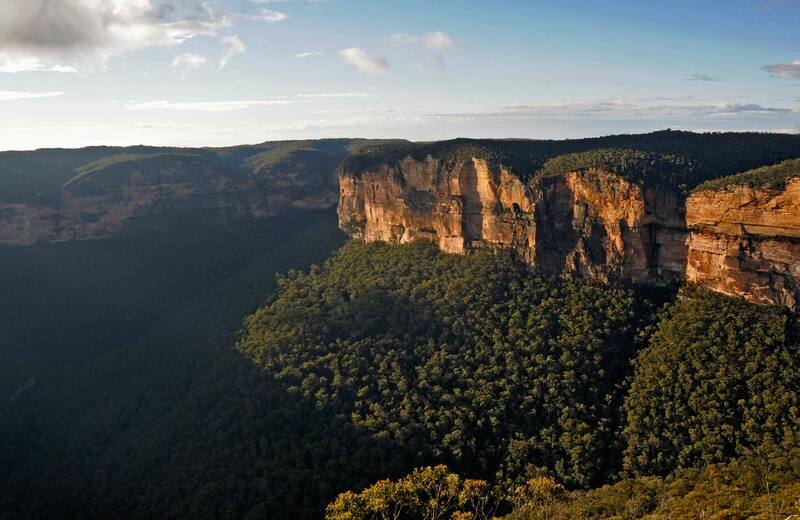 Come on a guided walking tour and learn about the history of Australia's oldest national park. Saturday 4 May 2019. Walks at 10am to 10.45am; 11am to 11.45am; 12pm to 12.45pm. Explore, engage, play and create at Royal National Park, near Cronulla in Sydney's south. Join a WilderQuest adventure led by an NPWS guide. Hunt for bugs and create art from nature.